Much like the woodchuck who could chuck wood, the beauty world has its own collection of paradoxical questions. Today's mystery revolves around one of our all-time favorite products: lipstick. More specifically, how long can we expect our lipstick to last? Think about it: You've had that favorite color of lipstick since when? Last season? Or...the season before that? Last year, even? It's been so long for some of us that we began to think there's a bottomless pit of color inside the tube. Luckily, the age-old mystery was laid to rest, thanks to some dedicated scientists/beauty nerds at Birchbox. After a lot of research, it was concluded that the average length of the female lip is approximately 55mm. With this in mind, the science team swiped four different types of lipstick on white butcher paper. After hours of testing, and what appeared to be an endless number of swipes, the research team had their answer. Drumroll, please! 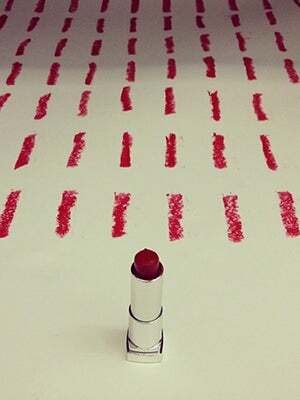 The average tube of lipstick provides 293 swipes. Now, if you applied lipstick three times a day, every day of the week, a single tube of lipstick will last you about three months. Not too shabby, right?